To change how you see the world, why not change how you travel it? Destinations are yours to discover more deeply, when you adventure by sea and land on a P&O Cruises holiday. Revel in the excitement of throwing open your curtains each morning to an astounding new view – all yours to explore. Kayak shimmering fjords in Norway, dive tropical underwater worlds in the Caribbean, or dine Bedouin-style under a blanket of stars in Dubai. Whilst on board our award-winning ships the epic experiences continue with exceptional dining, leisure and entertainment – all included as standard. Plus, on applicable Select Price holidays booked by 29 April 2019 you’re free to enjoy even more, with the gift of extra spending money added to your on-board account. Make every day your own with authentic experiences ashore – tap into the knowledge of a local guide, or explore independently – it’s up to you. With full days to explore, and many holidays offering evening or overnight stays too, you can decide what each day brings. And on some holidays you can delve even deeper with a City Stay or Land Tour. With the gift of extra on-board spending money, you’re free to shape every day your way. Whether you fancy a soothing spa treatment, to ‘dine out’ at our Select Dining restaurants, or an eye-opening experience ashore – there’s so much to choose from. Get 10% Discount For Past Guests! , Get 5% Newcomer Discount! Get 10% Discount For Past Guests! , Get 5% Newcomer Discount! , 3rd & 4th Passengers From £1 on selected dates! All Flights Included! , Upgrade your Dubai hotel to 5* from only £99pp! Sail to Southampton, Includes one-way flight and transfers! , No service charges on all P&O sailings from May 2019! Includes a FREE Desert Safari and Dinner tour from Dubai! 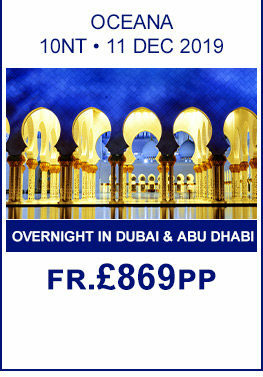 , Includes a 3 night 5* Dubai hotel stay! Exclusively for adults , Newly Reduced Prices! Exceptional value cruising! , No service charges on all P&O sailings from May 2019! All Flights and Transfers Included! , Get 10% Discount For Past Guests! , Get 5% Newcomer Discount! Fantastic Low Price! 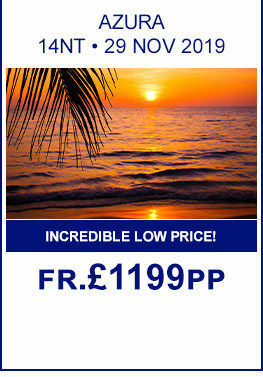 , Sail from Southampton, Includes return flight and transfers! 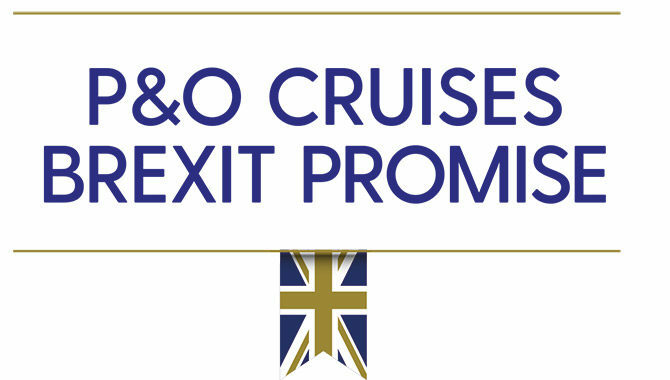 With every member of the eight-strong P&O Cruises fleet routinely calling on British soil, the cruise line is perhaps the best positioned for British holidaymakers looking to enjoy a no-fly cruise to some of the world’s most delightful destinations, with the option to cruise and stay. Despite routinely calling into the port of Southampton, the P&O Cruises travel far and wide to far-flung destinations such as Cape Town, Barbados, Cozumel, including world wide cruises. They also have an exclusive adults only class and plenty of long-duration cruises. Pay in pounds sterling when booking and on board - avoid potential currency fluctuations and explore Europe without the euros. You can also pay in advance for a range of exciting shore excursions. Sail from Southampton - P&O have hundreds of holidays sailing direct from the UK, the ultimate way to get your holiday off to a relaxing start. 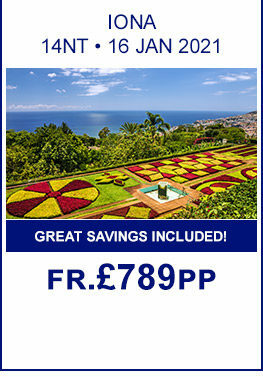 P&O 5% deposit offer - complete peace of mind that your holiday is booked ahead at a great price. 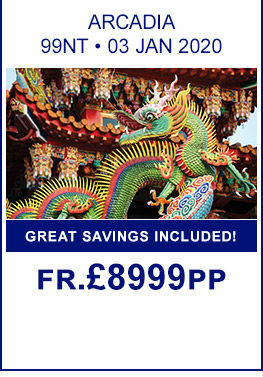 P&O 5% low deposit offer is available for a limited time only. The financial protection of both ATOL and ABTA. More holiday for your money - so much is included as standard, from meals and entertainment to flights and taxes. All of this combined with over 180 years of P&O history and expertise means we are well positioned to manage any possible impact on your holiday plans. Watch our video and see what P&O Cruises has to offer!